As 2016 draws to a close, we have put together some of our favourite edible image cakes of the year, in celebration of all you talented decorators! It also gives us the chance to wish you all a very Happy New Year and to keep on baking and creating in 2017. So let’s kick off this roundup with a Christmas themed cake. 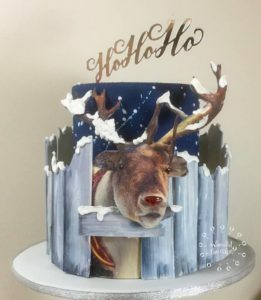 This was created by the very talented ‘Who did the cake’ It originally started life as a horse looking over it’s stable door, but was transformed into ‘Henry the Reindeer’ for the festive season. And what’s more, there’s a tutorial available so you can make Henry for yourself. We just love the edible image used for this cake. Next up is yet another talented and creative baker. Leigh Collins owns The Cake Mixture. She says this cake is her favourite edible image cake of 2016. We just love the attention to detail and the inventive way that she has put it all together. Great work Leigh. 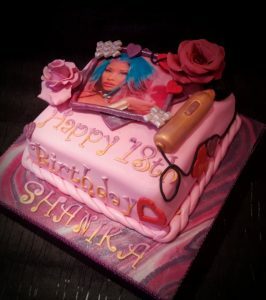 Up next is a very pink Nicki Minaj cake by sCrumptious Kakes. 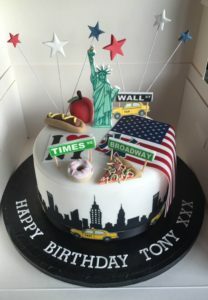 Edible images can turn any cake into a photo cake, which is ideal if you’re asked to recreate the image of a celebrity. This was made for a huge Nicki Minaj fan and we bet they loved it! We’re often amazed at the creative way you use Edible Images. This cake was made by Becky from BecksBakes. It was made in secret for her teenage daughter on a very hot day and anybody who decorates cakes will know that fondant does not like the heat. 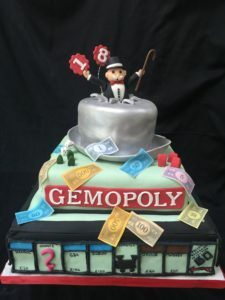 Great job though Becky and the edible Monopoly money is just genius. Thank goodness for edible printing, otherwise how would you make all these iphone cakes! 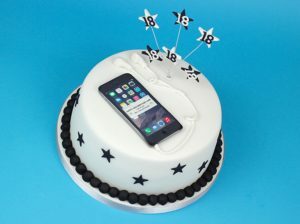 Thirzah from Cakey Goodness, has recreated the popular smart phone perfectly for this cake. We love the headphones too! A little while back we asked via Twitter for you to share your edible image cakes with us. 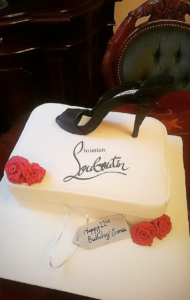 Misbah, aka Foody Mama aka cupcake-aholic, sent us her version of a Louboutin shoe. Using edible images for the logo and the shoe label, we imagine the edible shoe was a bit more affordable than the real thing! Remember to share you edible image cakes with us using #topperoo and in return we’ll share them with our community. And why not visit the social media pages of all the talented bakers featured here and let them know much you love their cakes too.